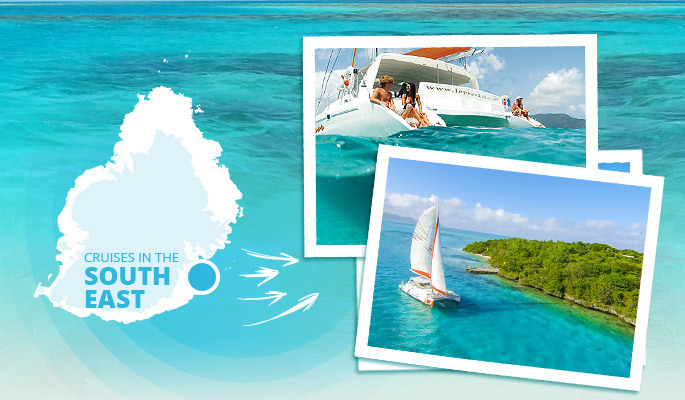 Embark on a dream Catamaran cruise and experience sailing at its best! 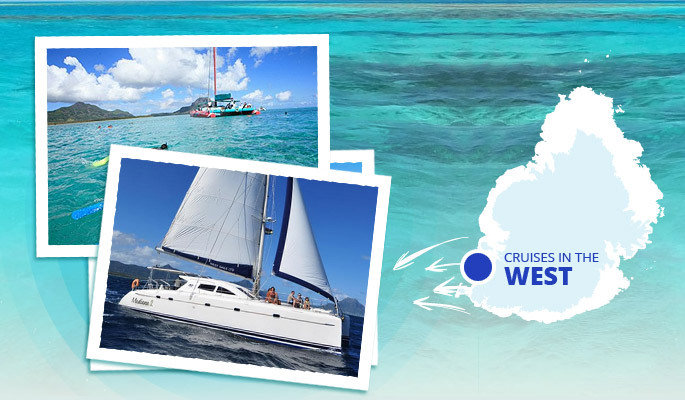 Spend a memorable day onboard Island Hopper or Cat Cruiser our Day Cruisers designed specifically for day sail excursions. After an exhilarating sail from Pointe Jerome, our catamaran will arrive at a snorkeling spot where it is your choice to either, swim in calm waters, snorkel with colorful reef fish, soak up the glorious sun rays or simply relax. Our catamarans will then take you to the mouth of GRSE river, where you will see the lush vegetation that lies on either side of the river’s banks and where you might get a chance to spot monkeys and bats on the tree tops before reaching the waterfalls. Then after you will be served a delicious BBQ lunch prepared by our friendly crew before reaching Isle aux Cerfs which is truly a perfect piece of paradise. Once on the island you may go for a walk on the beach and enjoy the islands renowned sand bank before setting sail back to Pointe Jerome with a chilled drink in hand whilst listening and dancing to the sound of the Sega music played by our crew members. Enjoy an unforgettable cruising experience on board on of our catamarans based in the north, Wind Dancer 1 & Wind Dancer 2", to Ilot Gabriel. During this excursion enjoy lunch and a full open bar service including both alcoholic and non-alcoholic drinks. The catamaran cruise starts at 8:30 am, departing from Grand Baie. The catamaran motors out of Grand Baie before hoisting its sails and heading for the islands, passing Gunners Coin, before reaching the lagoon between Ilot Gabriel and Flat Island. The sailing time to reach Ilot Gabriel is around one and a half hours. Ilot Gabriel is most famous for its beautiful unspoiled beaches and its crystal clear water surrounding the entire island. As one of the crew's mission is to ensure that our guests have a memorable time, they like to crack a few jokes, tell local tales, answer questions and play Mauritian séga which will set the ambiance for the rest of the day and lift the spirits of everyone on board. If you are lucky, you may see whales and dolphins during this fun adventure; in this case, the crew will stop the boat to allow you to observe these great animals from close in their natural habitat during the excursion. When the catamaran reaches Ilot Gabriel it will set anchor in an amazing lagoon, where swimming and snorkeling are a must before lunch is served. At around 12.30 you will enjoy a delicious BBQ lunch buffet onboard of the catamaran. Vegetarians are catered for too: notification should be given upon booking. You can then go and discover the white sandy beaches of Ilot Gabriel, enjoy a sun bath and simply relax and indulge this perfect setting before embarking on board to sail back to Grand Baie. During the sail back you can enjoy light snacks, the bar services and the live music. Expected arrival time back to Grand Baie is around 4 pm. 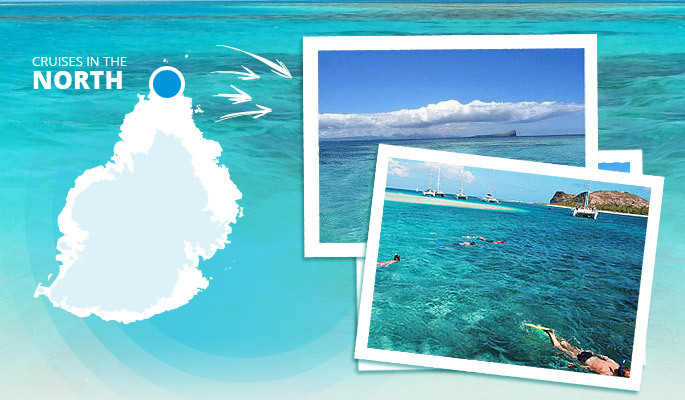 Gabriel Island: also known as Ilot Gabriel, this island located near Round Island and Flat island at the extreme north of Mauritius and about 10 kilometers north of Cap Malheureux. The distance between Gabriel Island and Flat island is only 750 meters. The size of the island is 42 hectares, making it much smaller than Flat island, and the highest point is 28 meters. Gabriel Island is a protected natural reserve. In comparison to Flat Island, Gabriel Island has less flora and fauna. The island is a very popular site for snorkelers and divers. Our full day catamaran cruise from the west coast of Mauritius can be booked on a shared basis or on an exclusive charter basis. This cruise will take you to discover the south west part of the island and bring along an opportunity to see dolphins. Snorkeling on the reefs and visiting Crystal rock and "Benitier" Island are part of the trip. This catamaran cruise includes a BBQ lunch buffet as well as alcoholic and non-alcoholic beverages throughout the day and the following attractions. When visiting Mauritius this cruise is a must do. It departs at 9am from Black River and sails in deep blue waters outside the reef towards Tamarin Bay allowing you to spot the school of dolphins living on the west coast of the island. A snorkeling stop is included in the itinerary near the reef of La Preneuse. Once there, you can either have a casual swim, snorkel with the colorful reef fish, have a drink or simply relax on the trampolines whilst enjoying breathtaking views of the Black River mountain range (amongst is La Tourelle du Tamarin and our highest mountain Le Piton de la Petite Riviere Noire rising to 828 metres). You will then go to visit the famous Crystal Rock which stands out in the middle of the lagoon. A delicious BBQ lunch will be served on board of the catamaran before heading to Benitiers Island and its beautiful white sandy beaches. As backdrop you will see Le Morne Mountain, classified as a World Heritage site by UNESCO in July 2008. The crew, who enjoys playing séga music and keeping our guests entertained, will make sure that you will keep fond memories of this day out at sea whilst visiting Mauritius. We sail back to the embarcation point at 4 pm. About Ile aux Bénitiers: L'Ile Aux Bénitiers is a rather long island which has a coconut tree plantation and has become one of the island preferred picnic spot for locals and tourists. The island's closest neighboring village is La Gaulette. On the north of the island live small colonies of migratory birds. This island is located in the lagoon of the west coast and is sheltered from swells and totally protected from waves and currents.